NOW: Looking northeast from 4th and Pine may we imagine the somewhat Gothic qualities of Westlake Center’s front door a fitting repeat for the Lutheran church that 125 years earlier first distinguished this corner with its grand steeple? On April 28 Denny Park Lutheran Church celebrated its 125th Anniversary. Thru the years the parish has changed its name and affiliations a few times while building four sanctuaries on four different corners. All were sited near the business district – at the expanding northern end of it. 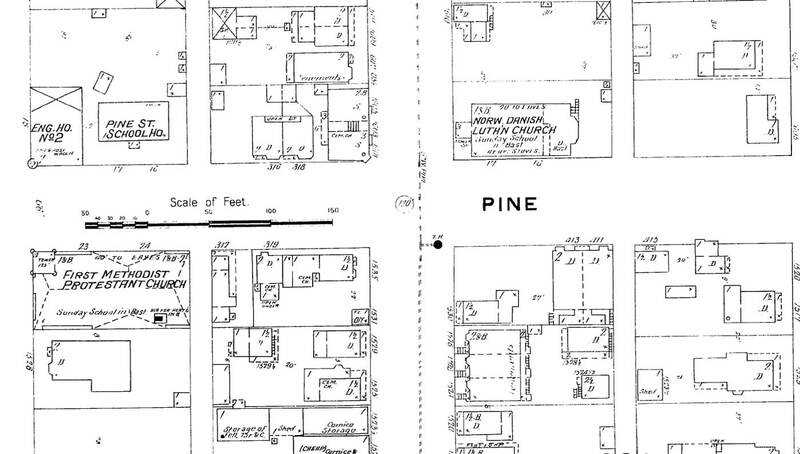 As an example, this, the first of the congregation’s homes, was built quickly at the northeast corner of Pine and 4th on a lot that cost $2,000 in 1888 and was sold for $19,000 a dozen years later. The congregation then soon moved seven blocks north to Fifth and Wall and built again on a cheaper lot. 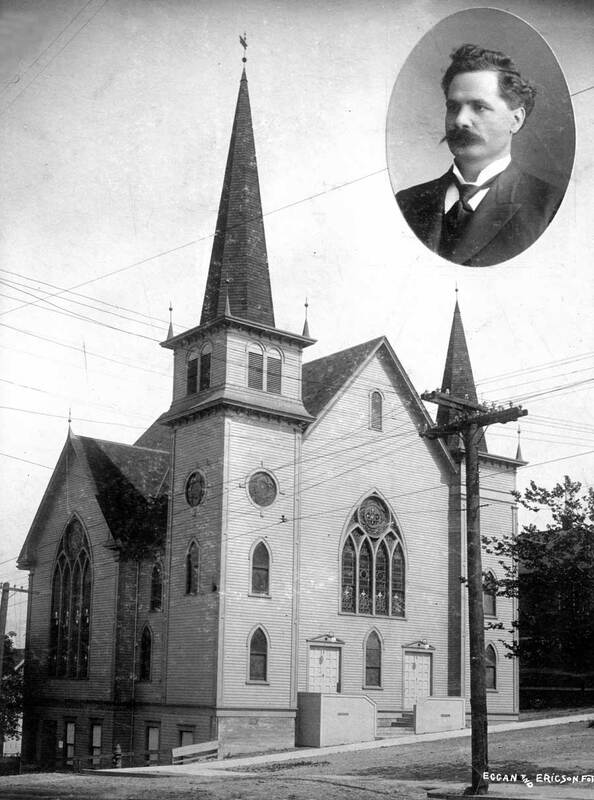 These adept economics were typical of many congregations sitting with their churches on Seattle lots made increasingly valuable during those most booming years of the city’s growth. Named the Norwegian-Danish Evangelical Lutheran Church by its 16 founding members in 1888, services were first held nearby in the Swedish Lutheran Church and when ready in the basement of this their own first sanctuary. To build such a stately tower must have required the charitable labor of at least a few skilled Scandinavian carpenters. By 1890 there were twenty churches within six blocks of these Lutherans at 4th and Pine, and seven of these twenty were identified by their attachment to Sweden, Norway, and/or Denmark. And the Scandinavian migration to Puget Sound picked-up in the 1890s when thousands more moved here, for nearly everything was like the old country: the fish, the trees, the dirt, the snow-capped peaks but without a state religion. The Lutheran’s second sanctuary also on the doomed Denny Hill. 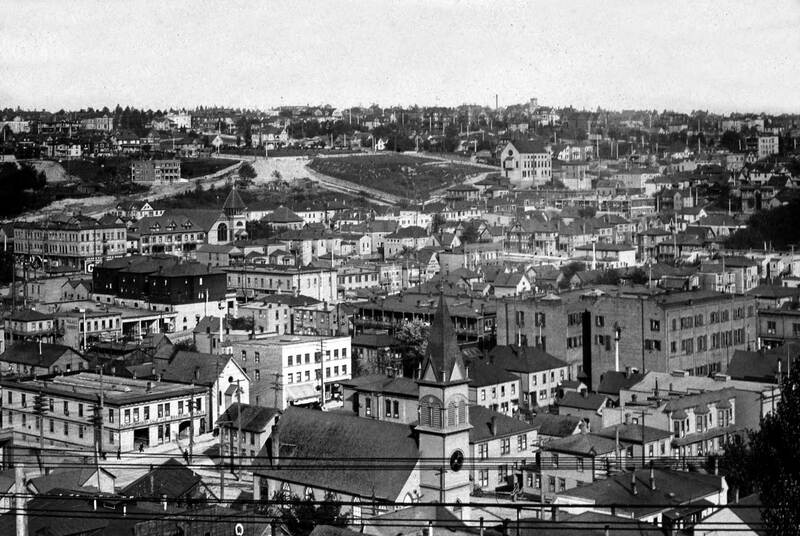 Leaving this southeast slope of Denny Hill in 1904, the new parish – with less tower but more pews – was still located on the doomed Denny Hill. Then five years later the second sanctuary was razed with the hill and these Lutherans were forced to build sanctuary number three. Erected at Boren and Virginia, it was the congregation’s home from 1912 to 1939 when they moved again, this time to Eighth and John. The parish then changed its name to Denny Park Lutheran Church identifying with the “green pastures” of its neighbor, the city’s oldest public park. 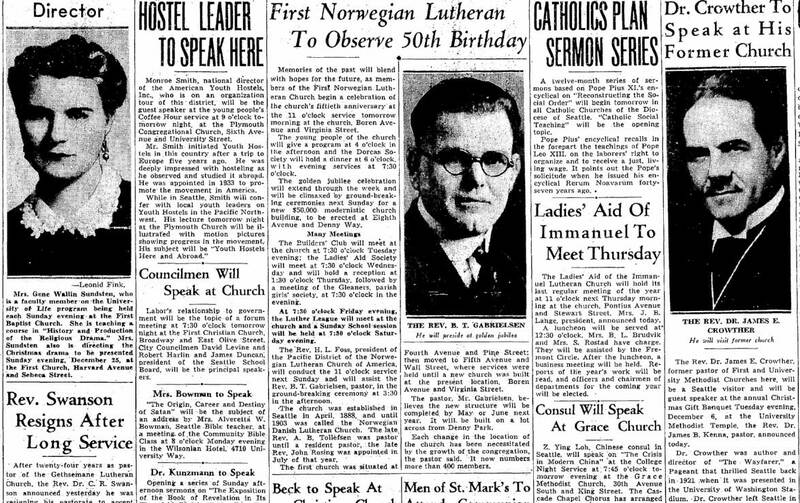 News of Norwegian Lutheran’s 50th Anniversary printed on the religion page for the Nov. 26, 1938 Seattle Times. Anything to add, Paul? 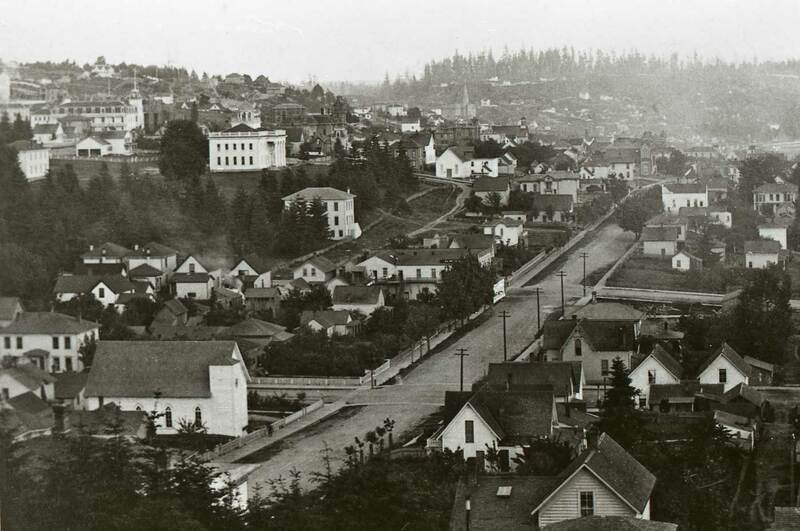 Mostly photos Jean, although we will start with another feature, one that looks east on Pine Street from near 2nd Avenue in the early 1890s. It includes our Lutherans at the northeast corner of 4th and Pine, the Methodist Protestants at the southeast corner of 3rd and Pine. The feature first appeared in Pacific on March 2, 1986, and is almost entirely about the Methodists – bless them. Looking east on Pine, ca. 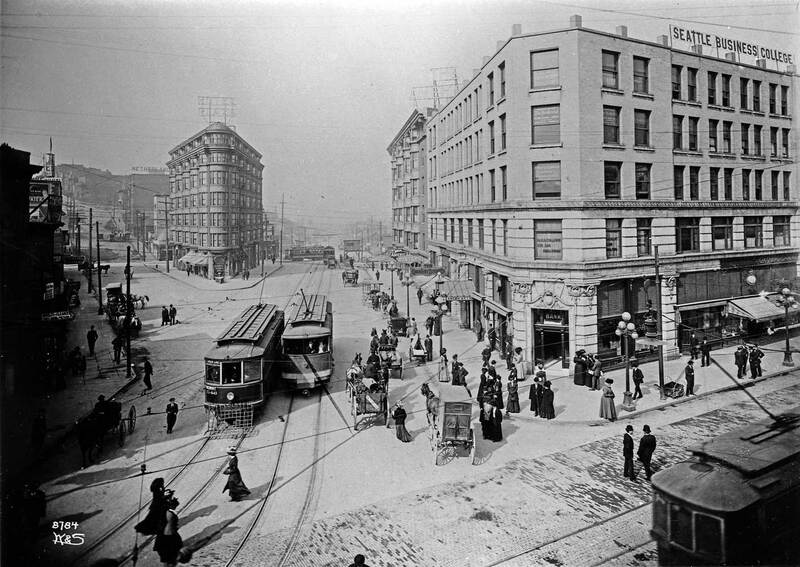 1892, from near Second Avenue. The first two churches in Seattle were both Methodist. One was Methodist Episcopalian and the other Methodist Protestant. Long before any Methodists settled in Seattle, their denomination split over how much power to give bishops. In 1865, when the Methodist Protestants of Seattle built their church, the primary difference between it and the earlier Methodist Episcopal sanctuary was not doctrine but color. The first church was white and the new MP sanctuary was painted brown. From then on they were known simply as the white and brown churches. Here the “Brown Church” has lightened up, with the third “permanent” home for the congregation. The original brown colored church at the northwest corner of Second Avenue and Madison Street was replaced in 1883 with an enlarged sanctuary. Its new stone veneer skin, however, did not save it from the “Great Fire” of 1889. 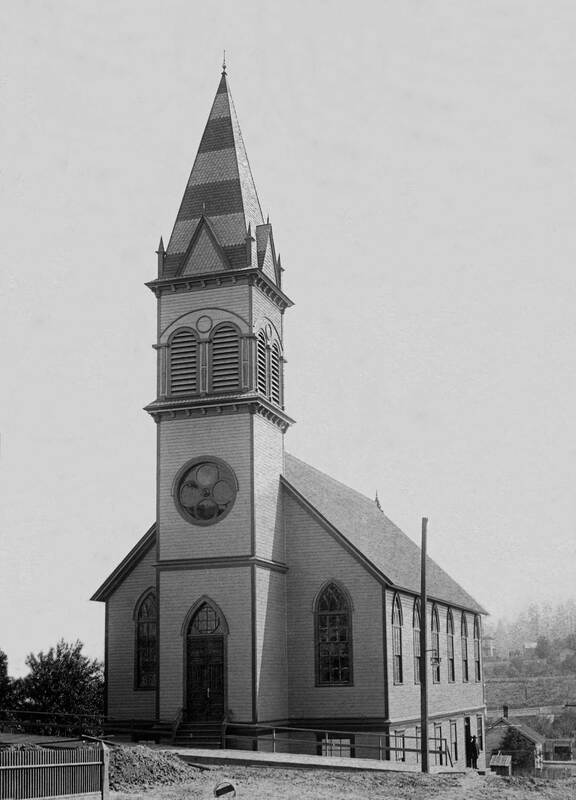 This is the parish that the congregation, after worshiping for a year in tents, built in 1890 at the southeast corner of Pine Street and Third Avenue. Clark Davis became pastor in 1885. He bought the lot and built this church for about $40,000. Next door he raised a comfortable parsonage for himself, his wife Cleo and their two sons. The Gothic Revival sanctuary could seat 1,000 and often did. Clark was ambitious and in 1896, after resigning his pastorate, he went for and won the jobs of registrar at the University of Washington and secretary to its Board of Regents. 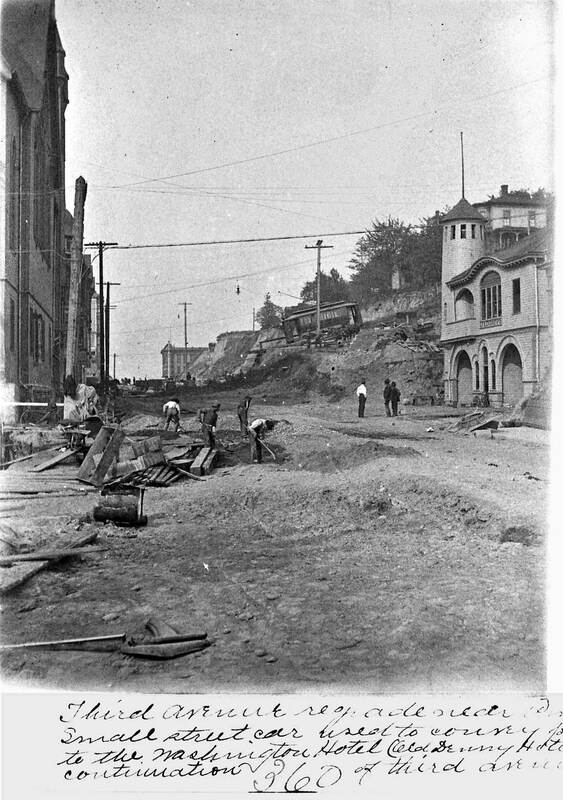 Regrade work on Pine Street looking northeast into the front “hump” of Denny Hill with the hotel still on top. Note the tower for the fire station far right. The Pine Street Regrade (1903-06) lowered this comer 10 feet and converted the church basement into its first floor. 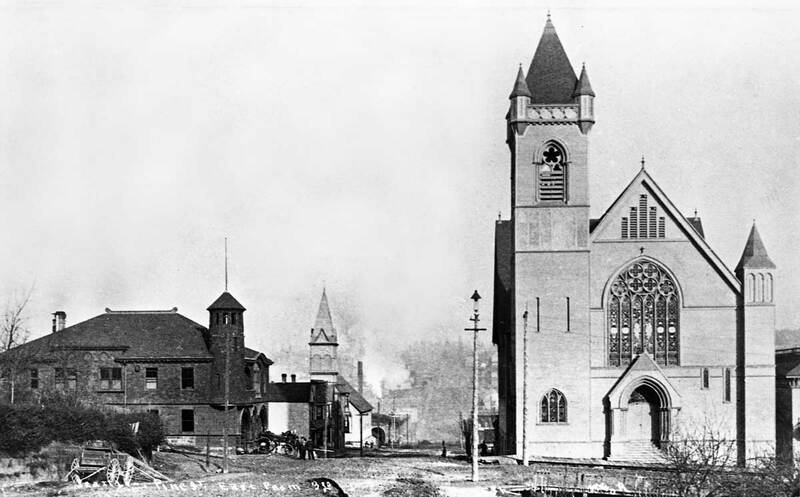 With regrades on Third Avenue and Denny Hill coming at them, the parishioners sold their comer for $100,000 and moved in 1906 to a new stone church on Capitol Hill. As soon as the Methodists moved out, the Third Avenue Theater moved in. 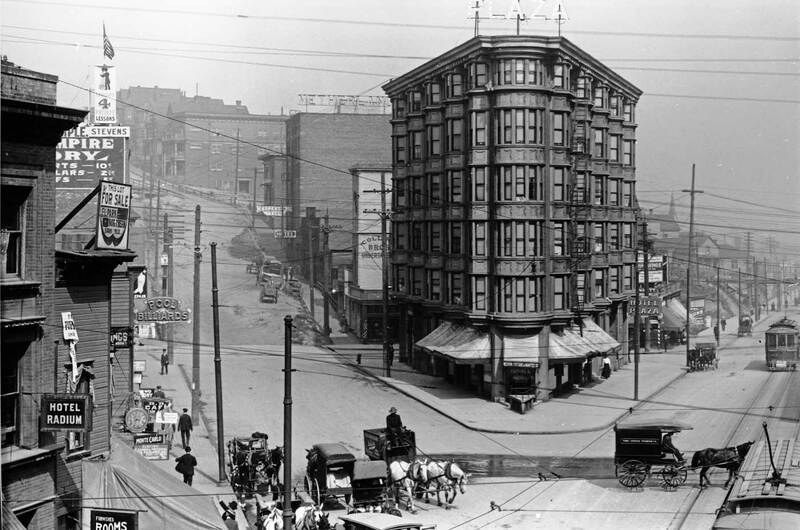 Dated 1904, the stereo looks south on Third Avenue from the Washington Hotel (built as the Denny Hotel). Note the fire station at the northeast corner of Pine and Third across Pine from the Methodists. 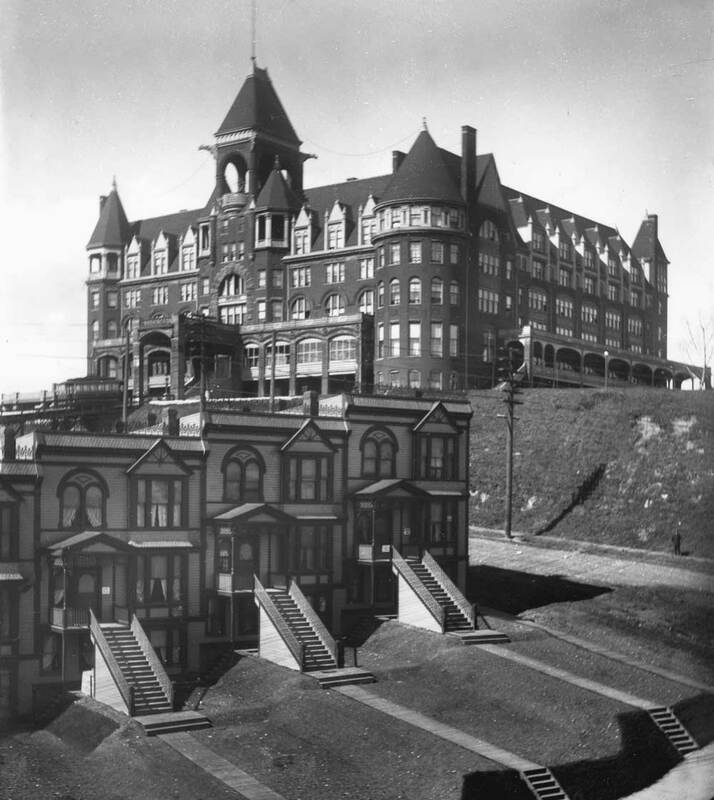 Note also the one-block long counterbalance trolley either climbing the hill from Pine to the hotel’s front portico or the opposite. Pine Street Regrade looking west from 4th Avenue ca. 1906. Fire Station No. 2 is on the left. The Lutherans are behind the photographer off-frame to the right. The north facade of the Methodist-Protestant church stands on the left. A detail from the 1890s Sanborn real estate map includes the Norwegian Danish parish, the Methodists, the Fire Station No. 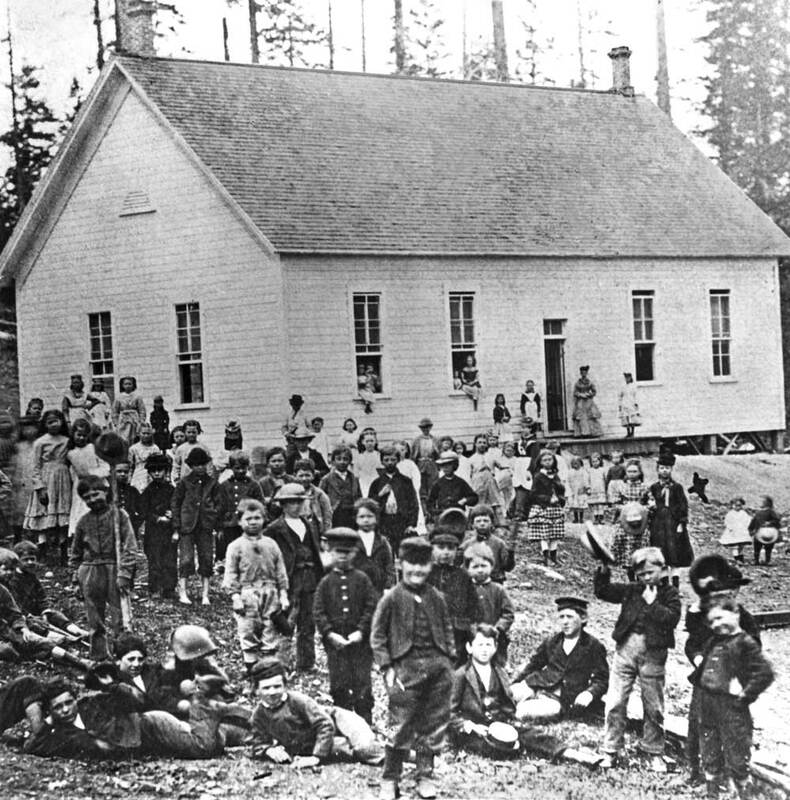 2 and next to the station the Pine Street School, one of the earliest of the community’s school structures and pictured below. The Pine Street School, aka North School, on the north side of Pine between Third and Fourth Avenues. 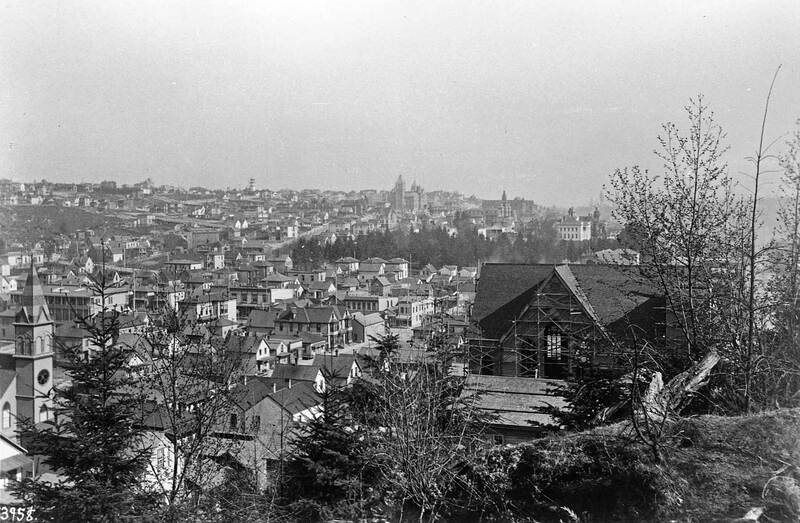 With the steeple of the new Norwegian Danish Lutheran sanctuary on the left, and construction still in progress on the Methodist Protestant Church, on the right, this F. Jay Haynes photo looks southeast from Denny Hill to First Hill. Note the greenbelt of the university campus at the scene’s center. The green reaches north as far as Union Street, the border there of the original campus. 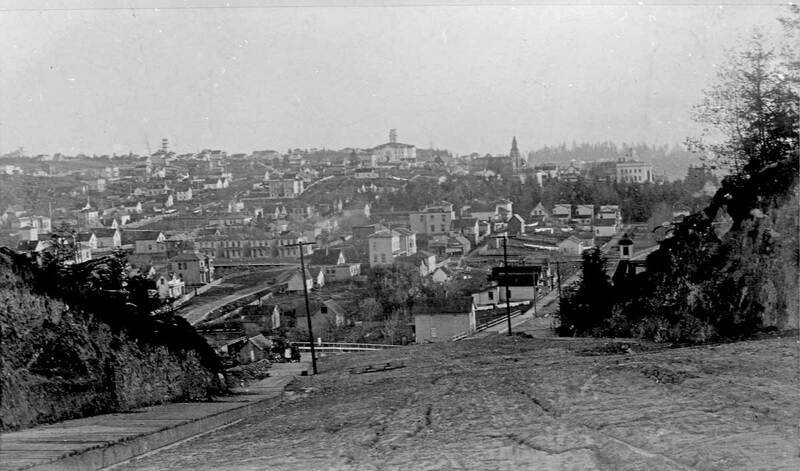 The Lutherans here hold the bottom-center of another recording of First Hill, or part of it, from Denny Hill. The barren or exposed patch is at one of hill’s steepest points, the intersection of University Street and 9th Avenue. Today Horizon House sits to the left of that patch and above it. Looking northeast at Denny Hill from First Hill. The Norwegian Danish Lutherans at the northeast corner of 4th and Pine appear here, from the rear, on the left. These Lutherans are sometimes mistaken for Baptists – the Swedish Baptists – that are nearby at the northeast corner of Olive and 5th Ave., and with their own slender steeple. They – or it – appear here on the far right. North on 4th or up the hill from the Lutherans much of the hill is yet to be developed with the row houses that are included in the next photo below. 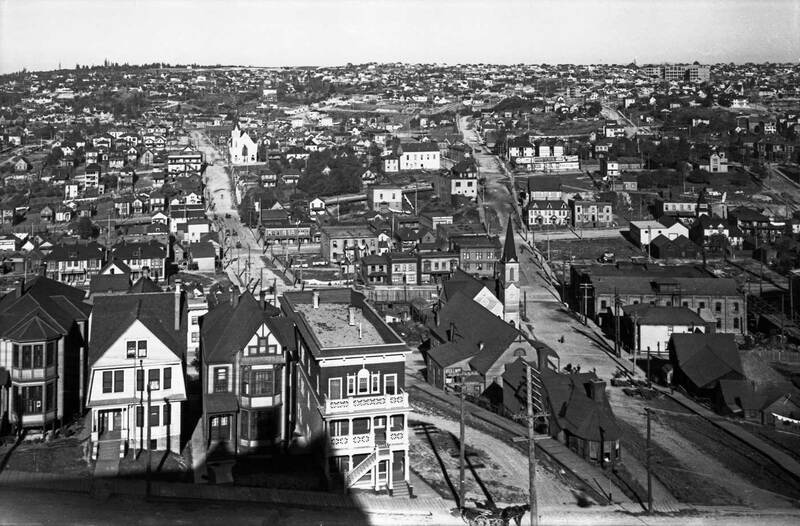 A few years before the Lutherans, looking south on 4th Ave. from between Stewart and Virginia Streets ca. 1886. 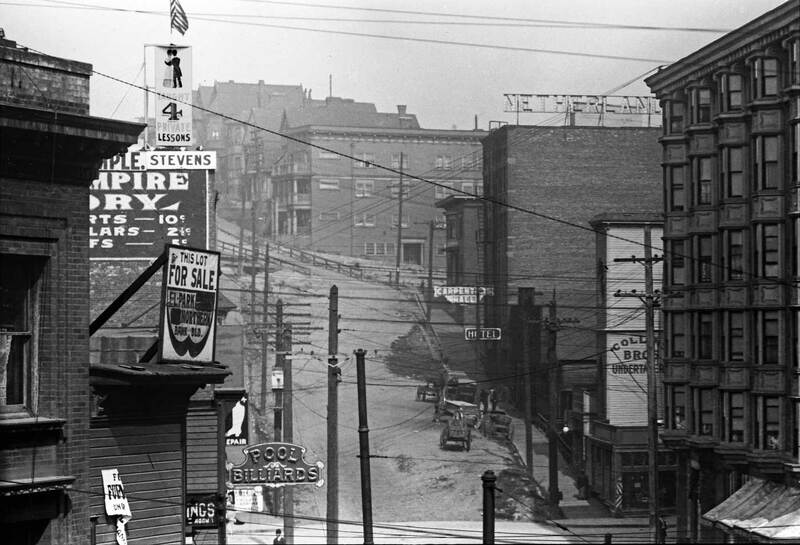 This steep ascent is still evident in the two subjects that follow, which look thru the same blocks in the opposite direction, north from Pike Street, and about 20 years later. NEXT we will ZOOM-IN on another look up 4th Ave from about the same time as the above classic. Both are from the Webster and Stevens Collection kept at the Museum of History and Industry. Click TWICE to ENLARGE or wait for the increased sizes of the next two subjects. The old spire-less Lutherans to the rear of the Plaza Hotel, and across Pine Street, are briefly home here for brothers Joseph P. and Ambrose A. Collins’ Undertaking Parlor. You can read some of their signs painted to the side of the still not so old church. The COLLINS BROS sign is seen, in part, right of center. Further up and north on 4th Ave, a three story apartment building – or rooming house – with open balconies facing 4th Ave. sits at the northeast corner of 4th Ave. and Steward Street. This structure appears as well in the subject printed first below this one. 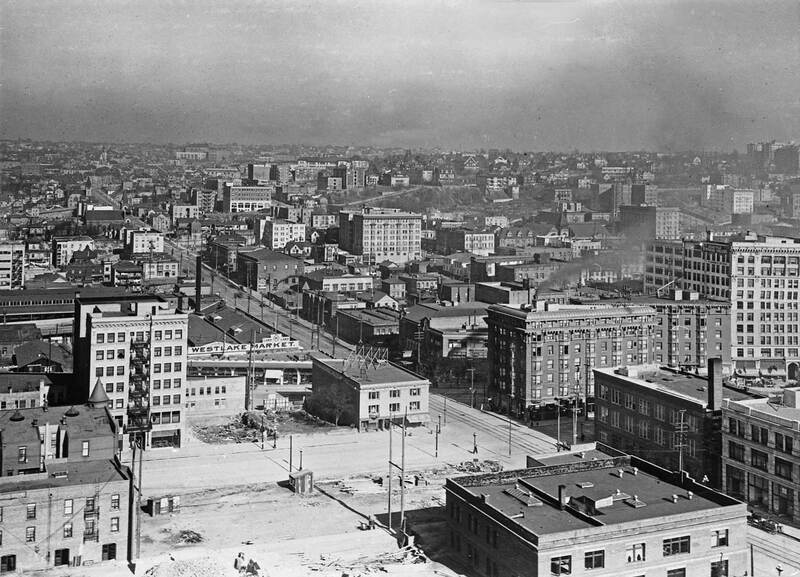 The shadow of Denny Hotel (aka Washington Hotel) darkens the bottom-left corner of this A. Curtis shot that looks east from Denny Hill to Capitol Hill. The structure noted in the 4th Ave. subject printed above this scene, appears here center-bottom at the northeast corner of 4th and Stewart. Five blocks to the west on Stewart, the bright white west facade of the Swedish Lutheran Church (Gethsemane Lutheran) shines from the southeast corner of 9th and Stewart. The climb east from 8th Ave. (home for Greyhound) is considerably steeper than it is now. Stewart was regraded through this block and its neighboring blocks too. At the bottom-right corner, Olive Way originates at 4th Ave. The steepel-less first home of St. Marks Episcopal is squeezed onto this flatiron block with the parsonage to this side of it. The slender steeple of the Swedish Baptist Church ascends above the Episcopalians. 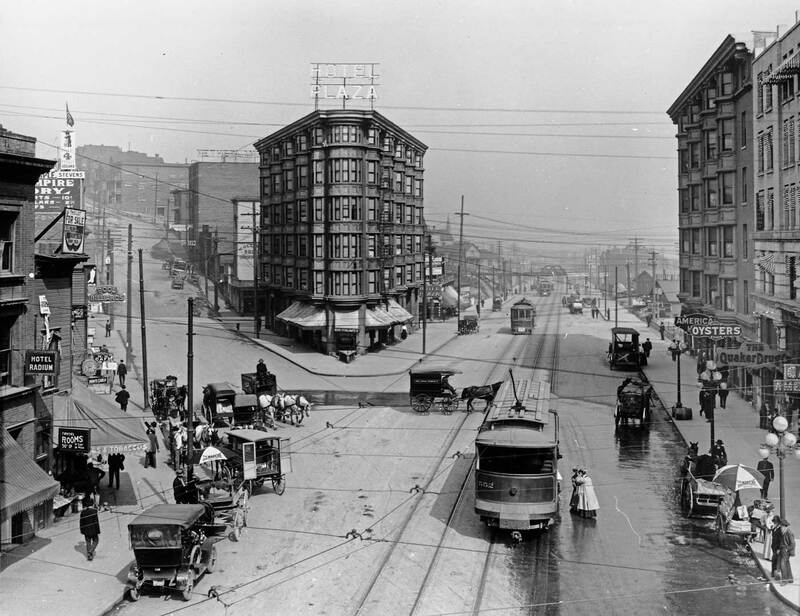 It sits at the northeast corner of Olive and 5th and so will be cut-through/eliminated with the creation Westlake Ave. in 1906. 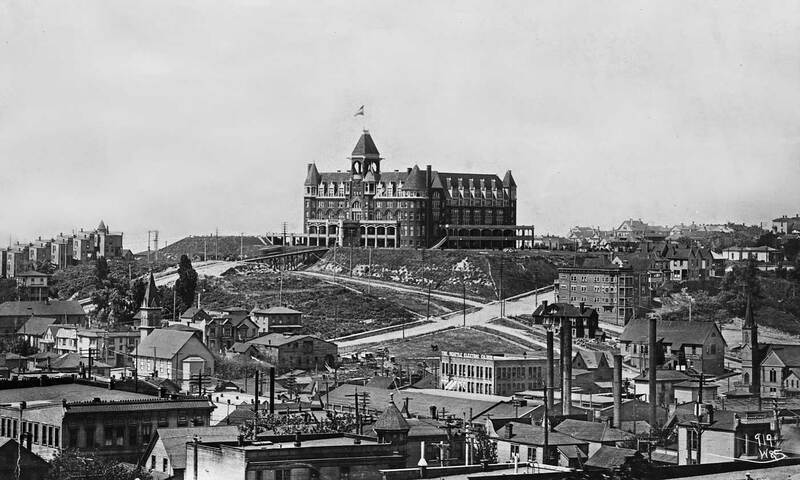 Work on the Seattle High School (Broadway Hi.) is reaching its top stories in 1900-1901, on the right horizon. 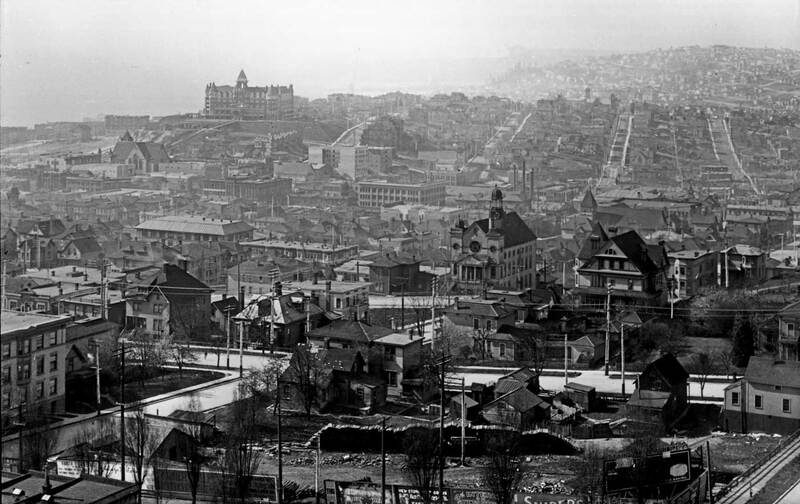 To earlier views looking east from the top of Denny Hill – included for comparisons to Curtis’ ca. 1901 subject above it. 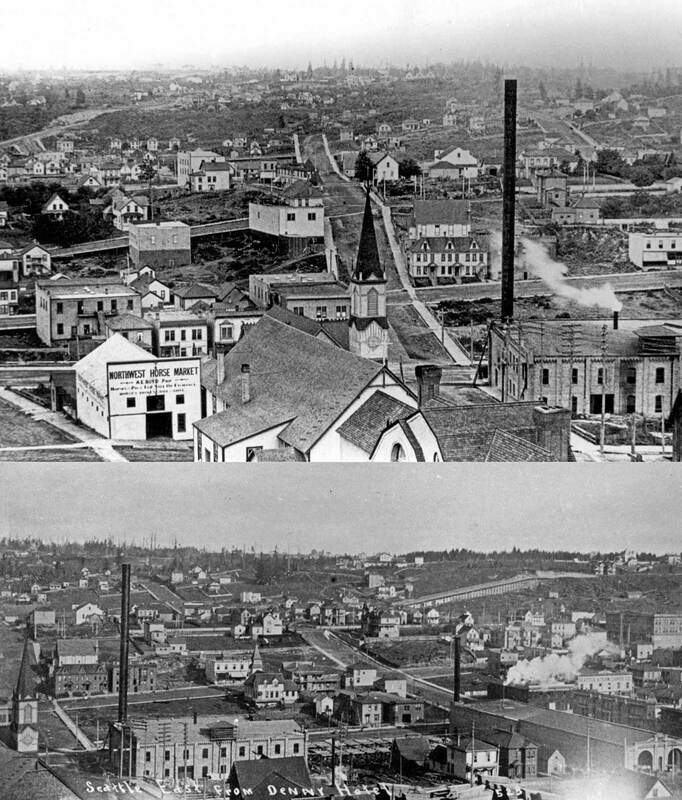 Note that the Swedish Baptists at 5th and Olive appear in both, as does Seattle Electric on the south side of Olive and as far as Pine Street. They ran the trollies. The razing of the Methodist Protestant church ca. 1909. The congregation has moved to its new home on Capitol Hill’s 16th Ave. This church at the southeast corner of Pine and 3rd was last used by the 3rd Ave. Theatre, which was forced from its stage(s) at the northeast corner of Madison and Third with the 1906-7 regrade of Third Ave. Although the same regrade reached this intersection it did not destroy the church. Instead a new main floor at the old basement level was added, and that change is witnessed here by the brighter coloring of the hall’s west and south facades at the sidewalk/street level. The brightness is dappled by what are certainly also colorful advertising broadsides. 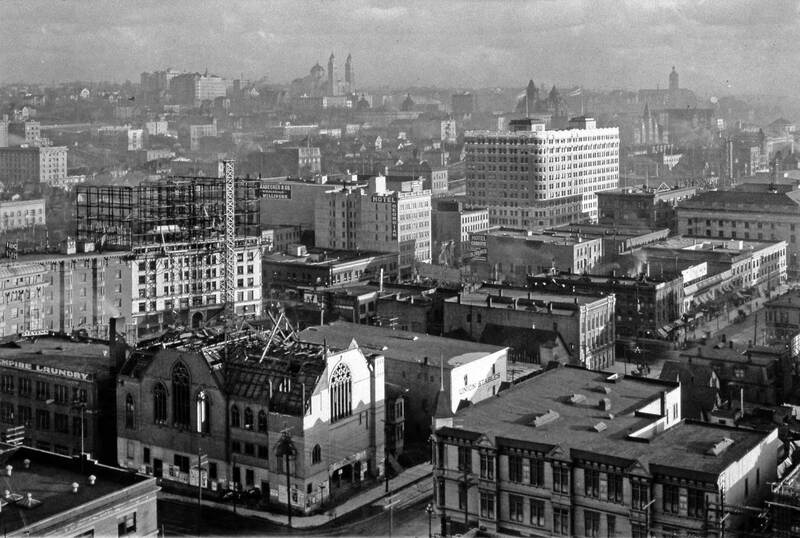 Above the church/theatre the top floors are being added to architect Van Siclen’s Seaboard Building at the northeast corner of Pike and 4th Ave. St. James Cathedral, still with its dome, is on the horizon. St. James was dedicated in 1907. The King County Courthouse is also on the horizon, but far right at 7th and Terrace. 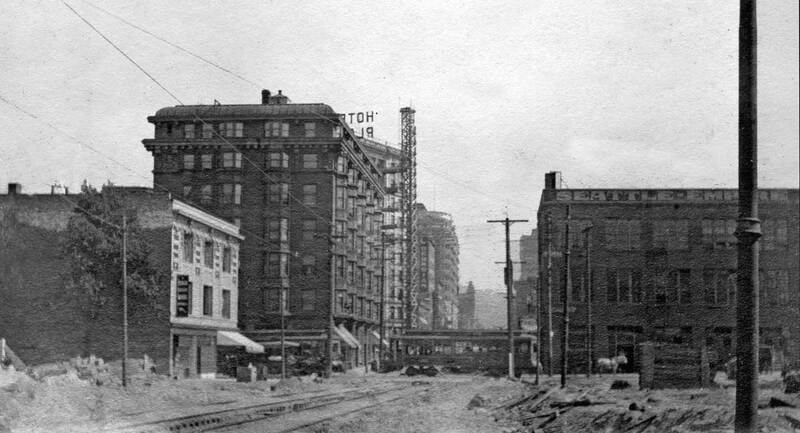 The flatiron Plaza Hotel is left-of-center, and to this side of it at the northeast corner of 4th and Pine is the new masonry structure that replaced the Lutheran’s church and the Collins brothers’ funeral home. This dates from ca. 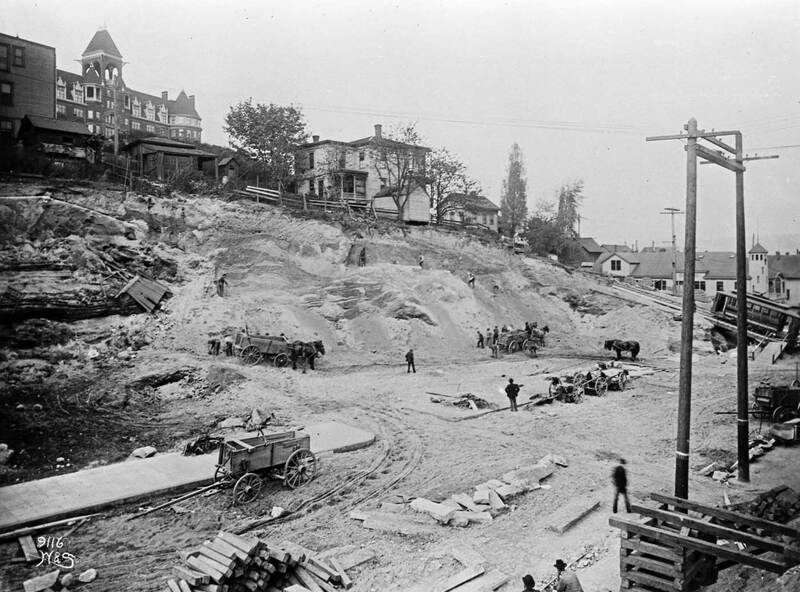 1909 near the end of the Denny Regrade, or that part of it that smoothed the old hill neighborhood as far east as Fifth Avenue. 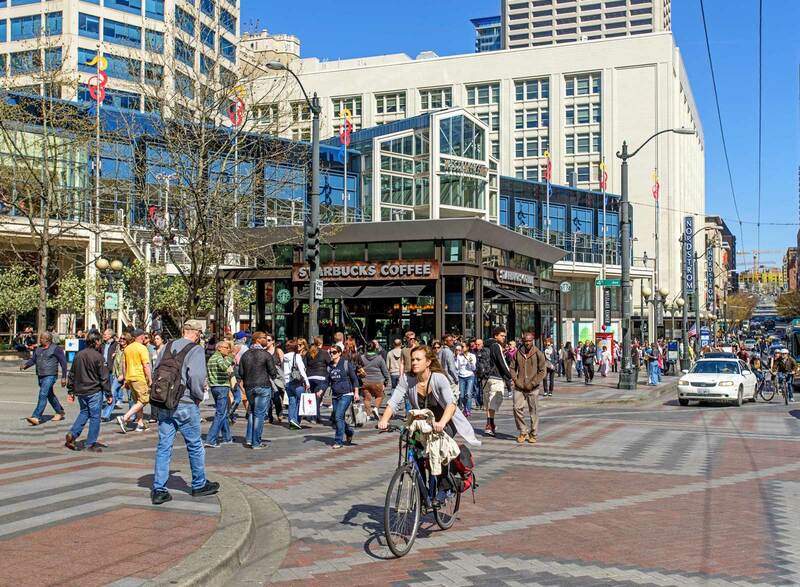 The same intersection of Pine and 4th – right-of-center – as that shown at street-level in the subject above this one. This was photographed from an upper floor (or roof) of the New Washington Hotel at 2nd and Stewart. 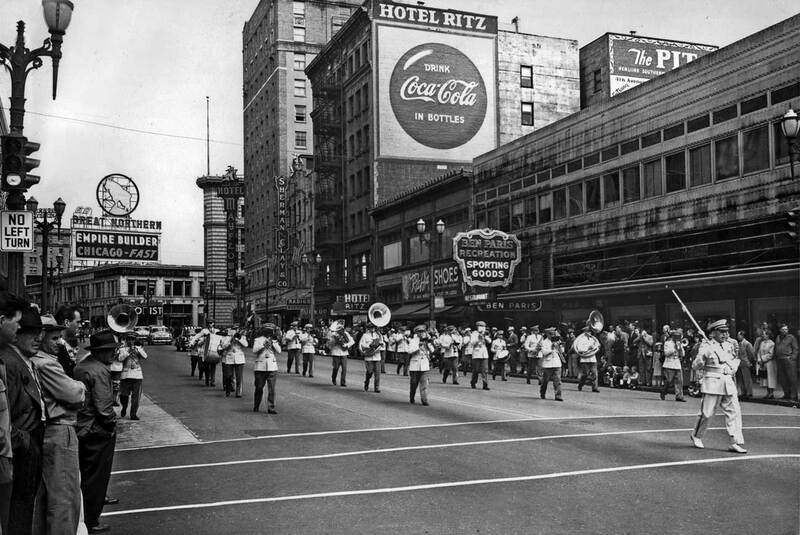 A parade heads south on 4th in the block between Olive Way and Pine Street on May 30, 1953. The Lutheran corner is – or was – on the far right. Behind it the Hotel Ritz was home for the Carpenters Union. Beyond that the Mayflower Hotel and the Times Square Building sit respectively on the south and north sides of Olive Way and still do. Note the once popular Great Northern goat sign down the way. Closer at mid-block is the once popular Ben Paris.